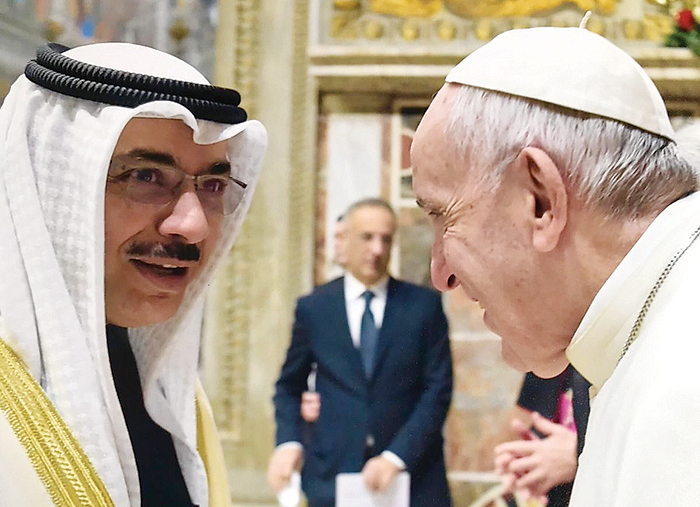 VATICAN CITY: Vatican Pope Francis expressed best wishes for a prosperous and peaceful New Year to the Kuwaiti leadership, headed by His Highness the Amir of Kuwait Sheikh Sabah Al-Ahmad Al-Jaber Al-Sabah, and the people of Kuwait. 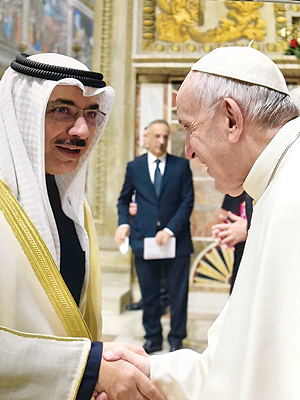 This salutation came during Pope Francis’s reception of Kuwaiti Ambassador to Switzerland and the non-resident Ambassador to the Vatican Bader Al-Tanaib. Ambassador Tanaib was among other diplomats and Ambassadors visiting the Vatican to meet the Pope during an annual reception. During the event, Pope Francis called for spreading peace and goodwill throughout the world and avoid any action that would lead to hate and conflicts. The Pope also called on the international community to find means to end various global crises and focus on welfare and development to all mankind.